A Government survey has been assessing how our housing stock could be updated to better meet society’s needs. Accessibility is rightly identified as an important factor, says Chris Coxon, Head of Marketing at Eurocell. Nearly one-third of households in England have at least one person with a long-term limiting illness or disability. The three most common limitations are physical – problems with mobility, stamina and dexterity – which together account for 43 % of cases. These findings come from the English Housing Survey (EHS), ongoing Government-sponsored research which aims to map out the state of our housing stock and the needs of its inhabitants. With an ageing population and an increasing number of multigenerational households, access and adaptability are moving up the political agenda – and rightly so. The EHS, conducted on behalf of the Department for Communities and Local Government (DCLG) involves around 13,000 face-to-face surveys and 6,000 physical inspections by surveyors every year. Statisticians rebalance the results to better represent the general population. The main findings of the survey are published each March with drill-down reports released over the summer. One of these drill-down reports looks at the potential for improvements to the housing stock and this year contained three main sections looking at housing quality, energy and adaptations and accessibility. 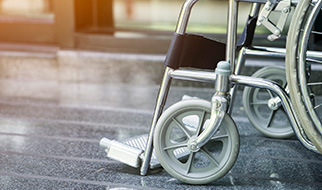 Though 31% of households had someone with a long-term limited illness or disability, only 18% had level access to the front door; 25% had a flush threshold and just 13% had both level access and a flush threshold. The research suggests that a further 58% of homes could be made more accessible by the addition of a ramp. NHBC guidance published this year, Accessible thresholds in New Housing – guidance for housebuilders and designers, though aimed at newbuild, is a useful reference document which dovetails with Part M of the Building Regulations, Access to and use of Buildings. The guidance sets down minimum slope for ramps, when upstands are needed, and the design and detailing of the threshold itself. Manufacturers, such as Eurocell, are also responding to the need for level access. Earlier this year, Eurocell introduced a new PVC-U low threshold for its Eurologik 70mm chamfered and ovolo doors. One of the biggest benefits of the PVC-U low threshold when compared to its aluminium equivalent is that it can reduce cold bridging, limiting heat loss and improving comfort. One of the biggest challenges in delivering any improvements to access for existing homes is how to limit costs and disruption to households. But this isn’t a problem that is going away; we need more cost-effective, easy-to-install solutions that can help us meet these challenges.